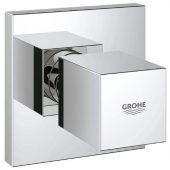 The product series Eurocube from Grohe offers a very special and high-quality bathroom concept. Their design excels with its cubic shape and gives your bathroom a modern, clear structure. The smooth surfaces, in chrome colors, create an innovative flair and bring the future feeling of living into perfection. A design variant with a discreet joystick handle instead of the lever handle represent the products of Eurocube Joy. Thanks to the FeatherControl cartridge, this joystick handle can be easily operated with your fingertips – and even years later. The large angle of activation enables precise temperature adjustment. 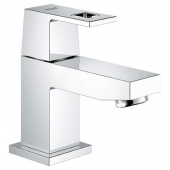 The design of the faucet body corresponds to that of the Eurocube faucets. 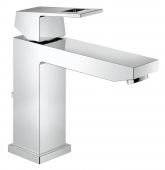 The single-lever basin mixers of the series are available in sizes XS (110 mm), S (157 mm), L (248 mm) and XL (312 mm). The design of the L version differs from the other sizes. It has longer spout, which does not emerge directly from the main body, but instead placed on top of it. The size XS is particularly suitable for the guest toilet. The small square gap in the lever handle is a clever detail to take the cubic form of the series. 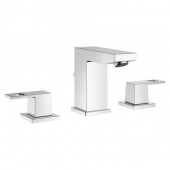 If you prefer a fancy washbasin faucet, you can choose one of the two “two-hole” basin mixer (projection 231 mm or 171 mm) for wall mounting or the three-hole washbasin mixer, also for wall mounting. They have two-handle mixer whose handles point to the right and left, creating a symmetry. Both handles also have the square opening. The basin mixer in the Eurocube Joy design with the joystick handle on top of it is also available in addition to the three-hole basin mixer and the stand version in size L.
The matching washbasins are presented on Grohe website under BestMatch. Various washbasins, such as the ones from Villeroy & Boch and Duravit were tested with the Eurocube faucet, paying special attention to splash behavior, ease of use and good design. The bidet faucets have the same shape as the washbasin faucets. At the outlet, a ball joint outlet is additionally attached, with which the water jet can be exactly adjust. Thanks to SilkMove, the lever handle can also be adjusted precisely and operated continuously. In addition, the bidet faucet is offered in the joystick version with precise control. 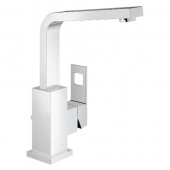 The shower range includes two one-hand shower mixers (surface-mounted and flush-mounted). The flush-mounted version is attached on a square rosette, the surface-mounted version shows off the cubic forms even more clearly, as they consist of several blocks. For this version, an extra shelf is also available on which shampoo bottles and similar utensils can be placed. The surface-mounted single-lever shower mixer is alternatively available with the joystick handle as Eurocube Joy. The joystick handle is then placed on top of it. As suitable alternatives, the shower systems from the Euphoria Cube series can also be used, which take up and continue the cubic shapes perfectly and thus create a uniform faucet design. The highlight of the series is the free-standing single-lever bath mixer, which is also available with the joystick handle. 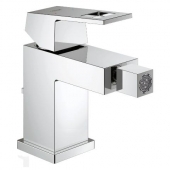 It consists of a 844 - 948 mm faucet body, from which the outlet comes out. 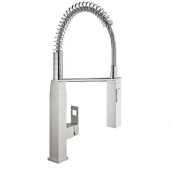 In addition, the faucet is equipped with a hand shower and the matching TwistFree hose to protect the hose from twisting. The spout projection is 298 mm. 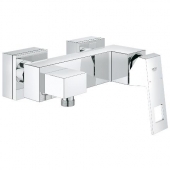 Classic single-lever bath mixer (surface-mounted) with or without shower are also available. The shower is mounted next to the faucet using a separate holder. Like the shower faucet, the bath faucet also consists of several cuboids and thus shows a maximum cubic appearance. The faucet without shower is also available with the subtle and filigree joystick handle in the Eurocube Joy design variant. If you want to combine the bathtub inlet separately, you can choose the one-hand bath mixer (flush-mounted) with diverter. The three- and four-hole combinations (with and without hand shower) with lever handle and diverter are also available in a cuboid shape. The outlet is completely rectangular and designed with clear edges. The hand shower is also straight, which underlines the straightness of the entire line of faucets. The Grohtherm Cube thermostats can also be combined as thermostats. Eurocube has two different single-lever kitchen mixers in the range. The professional shower with a 360 ° swivel spout, where you can switch between rinsing and shower jet by pressing a button. The spring suspension provides maximum flexibility for all kitchen work such as filling pots and cleaning work surfaces. Although the spring suspension breaks up the cubic design slightly, but this is compensated by the valve body and the lever handle. The second variant shows slightly more angular shapes, as the outlet is bent at a right angle and kept flat. It can also be swiveled through 360° and has an additional high spout (285 mm), which offers maximum freedom of movement. 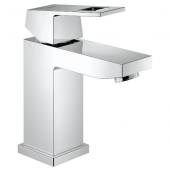 The kitchen faucets are available in chrome and supersteel. Suitable accessories are those of the series Essentials Cube. Here you will find soap dispensers, toilet brush sets and towel rails in cubic shapes, some combined with cylindrical shapes that loosen up the design a bit. Sets of three or four items are also available.